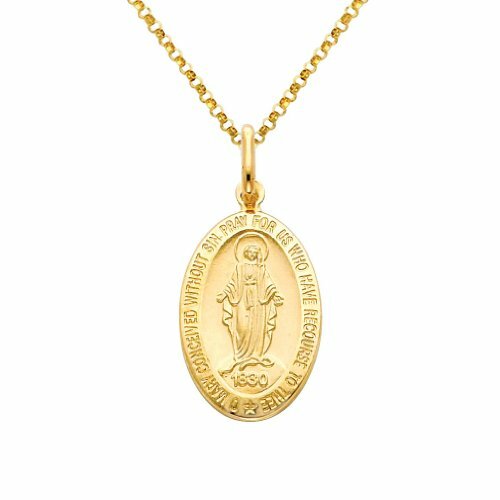 Wellingsale 14k Yellow Gold Polished Religious Miraculous Mary Medal Charm Pendant with 1.2mm Classic Cable Chain Necklace - 18'' by Wellingsale® at The Bling Tree. MPN: J-LGDI-PT-0276.CH-0227-180. Hurry! Limited time offer. Offer valid only while supplies last. WELLINGSALE® Features:1. Stunning High Polished Finish2. Made using only the most premium and pure materials3. Non tarnish, Stunning Color4.